I've been a negligent boy lately. Negligent for not paying enough attention to what's been going on in the Green Party with regards to the upcoming Biennial General Meeting, being held in Toronto this coming August. Motions have been available to be viewed on the Green Party's website for some time now, and just tonight I've finally started to turn my attention to them. I, along with all on-line Greens, received a letter from Elizabeth May, telling me that the motions being proposed for the General Meeting are significant, and may end up changing the structure of the Party. May says that she could be forced to resign if some of the motions are passed. Serious stuff indeed. But going through these motions is going to take significant time, which is something that I haven't had as much of lately as I would like. And my goodness, there are a LOT of motions being proposed. This is going to take longer than even I had hoped. It's no wonder that so many Greens are turned off by this process, that they don't bother to vote. You'd better be prepared for a marathon when you log in. And best of luck trying to figure out exactly how these governance-related motions will really work. I suppose the people who put all of this together figured voters could use some help. They have kindly provided a “Considerations” section as a preamble to the motions, which seeks to identify what the motion will do, whether there are conflicts with other motions being proposed or with existing by-laws of the Party. Swell. Well, no, not so swell. 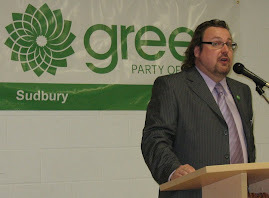 Tonight, I decided to tackle those motions of primary importance to me, as CEO of the Sudbury Federal Green Party Association. Specifically, the 15 motions grouped under the “Organizing – EDA's” heading. What a marathon. Here are my observations on the first of many of the proposed motions. But first, a quick discussion of those “Considerations” which preface the motions. In some cases, the “Considerations” are fairly short, and imply that the motion is seeking to codify an existing situation. Where I came across those Considerations, I was uncertain whether the situation described was really one which was in existence for everyone or not, but the situations did seem to largely be “best practices”. On first glance. When you dive into the actual wording of the motions, I was left with the impression that the situations being described in the motion were vague or ambiguous. Hardly the right approach for creating true best practices. On other motions, the “Considerations” were quite lengthy, and in my opinion, biased against the motion. No surprise that these motions appear to have been sponsored by some members who have been vocal regarding their concerns with the Party's direction, either their blogposts or comments made on other blogs. The bias was very apparent to me, and in some cases, including misrepresentations about specifics of the motion itself (for example, motion G10-d12, the Considerations suggested that the Second clause of this motion contradicted the Constitution. No, it did not contradict; it created a situation which would be considered ambiguous, but it was not an outright contradiction. The use of the word “contradiction” here likely would bias a casual reader of this motion to potentially vote against it). Interestingly, those Considerations failed to pick up on a glaring oversight perpetuated in many of the motions, sponsored by long-time Greens and some members of Federal Council. These motions often referred to “Riding Associations”, despite the fact that there are no such units in the Green Party of Canada. We have “Electoral District Associations” whose jurisdiction corresponds to many of the 308 Electoral Districts which comprise Canada. Just a small matter, you say? Maybe so...maybe we all know that a “Riding Association” and an “Electoral District Association” are intended to be the same thing...but what about those that don't know? What about those who go looking for a definition in our Constitution and fail to find one? What should they assume? Better: why the imprecision of the language used in the first place, especially when using the correct term required no greater effort? Yet the Considerations failed to remark on this imprecise use of language. Indeed, the Considerations remained silent on a large number of ambiguous points. A number of the motions being considered will create numerous new responsibilities for EDA's, and set out consequences (financial and de-registration) as potential consequences for an EDA which does not follow these new responsibilities. All of these motions seem to have been sponsored by the same group of Greens. Since Ralph Benmurgi's name appears first (alphabetically) on the sponsor's list, I'll refer to these as the Benmurgi Resolutions (and they are: G10-c14 through c23). The Benmurgi motions, taken together, will create new reporting and other requirements for EDA's beyond which are currently required by the Party. Many of these requirements are could be considered “best practices” in building responsible relationships between EDA's and the Central Party. However, the structure of these motions is problematic, due to the vague wording which is used. Although many EDA's and Central Party have great and wonderful relationships, there is sometimes friction. The Benmurgi motions, through their vagueness, completely stacks the deck against the EDA in favour of the Central Party. In short, the Benmurgi motions leave lots of room for interpretation, and since the consequences of not being responsible fall squarely and only on the shoulders of the EDA's, they're the ones who may end up getting burned due to a lack of precision in the language used. By way of example, I offer the following (beyond the use of the term “Riding Association”, which is present in every motion, and which I've already explained really has no meaning as far as our Party's Constitution goes...one could suggest that since the Benmurgi motions refer to something which doesn't exist, they have will have no impact on the relationship between EDA's and the Central Party...but I'm not going to be that one this time). G10-c14, Riding Association AGM's, requires that an EDA hold an AGM every 15 months, and that minutes are submitted in a timely manner to the Party. Seems pretty straight-forward, and certainly providing the minutes to the Party seems like a best practice. Except...who is the Party? There is no unit of the Party in the Constitution which is identified as “the Party”. Indeed, where the Constitution refers to the Party, it is implying each and every member and each and every unit. The Party is ALL OF US. So, as CEO of a “riding association” which has just had a General Meeting, who do I submit the Minutes to in order to be in compliance with this motion? Maybe I'll have to post them on the website somewhere, so all Greens can view them. Again, a lack of precision in language here, where imprecision wasn't necessary. Why not just say submit the minutes to the correct organizer, or maybe to the Chair of Federal Council, or to the Chair of Campaign Committee, or whoever would be the right position to send them to? Trivial? Maybe; but when it comes to best practices, ambiguity is problematic. G10-C16, however, seeks to change all of that. Part of this motion requires that an EDA has an adopted Constitution. Fine, great idea. But wait. The motion goes on to clarify that the Constitution of EDA's will be one “provided by the Party”. Hmmm...why not let EDA's create their own constitutions? Further, this motion goes on to indicate that any amendments to a local constitution must be approved by the Party. Yes, APPROVED. That's veto power over a local EDA's governance document folks, and that's very insightful as to where all of these Benmurgi motions are leading: together, they will severely curtail EDA autonomy. Again, I'm not sure who “the Party” is here. Maybe that's all of us at a Biennial General Meeting (and won't it be fun to have to go through all of the local constitutional amendments as well the next time we have a BGM?). So...approval is required, but the by whom isn't identified. This is vague and ambiguous, and frankly shoddy work on the part of the sponsors, especially when there was no need to create this kind of ambiguity. Members have the right to vote. Section 1.3.1 refers to when a member ceases to be a member, and Section 1.3.1.4 clearly indicates that a member ceases to be a member only when not in good standing for 12 consecutive months or more. This means that “lapsed” members remain members and are eligible to vote, despite not being “members in good standing”. In this instance, the template provided by the Party is in contradiction to the Party's Constitution. I've brought this to the Party's attention in the past, and I've blogged about it as well, but nothing appears to have been done (unless this is addressed in a motion which I've not yet reviewed, which is possible). One last thing about this motion: to which EDA's is it intended to apply? The motion says “Riding associations will adopt a basic constitution provided by the Party....” When I read this, to me it means that to be in complicance, the Sudbury EDA will have to go and adopt this new basic constitution, despite the fact that we already have a constitution. You have a different interpretation maybe, one which suggests that those EDA's with constitutions in place would be exempt? Why would you think that? It says “Riding Associations”, presumably meaning EDA's. It doesn't make any allowances for those with Constitutions in place already. The lack of additional language here implies that all EDA's will have to adopt the basic constitution. The motion could have been more specific if it intended otherwise. But it's not more specific. Again, more evidence of a poorly worded motion leading to ambiguities. But what is clear is that this motion will strip EDA's of local autonomy. G10-c17, riding associations will provide contact information for CEO's and FA's to the Party. Again, not sure who the Party is. However, this motion really is codifying a best practice. It galls me that we actually need something in our Constitution and by-laws to trigger this, but I understand that this has been an issue. G10-c18 provides a process for the assets of de-registered EDA's to be transferred to the Party and held for up to 2 years, until a new EDA can be registered. I would like this if I knew to which unit of the Party the assets were to be transferred to. Also, I'm not sure what the mechanism for transfer will be. Will someone from the Central Party drive out to the EDA and pick up the banners and signs, or will the now-former CEO have to continue to store them in her garage? G10-c19 requires that a copy of the local EDA's Constitution, certified by the CEO, be forwarded to the Party and kept on file. I see the need for the Central Party (presumably the National Office) to have on file the right copy of any local Constitution. What I don't understand, though, is the need to have a CEO certify a copy. First, if the earlier Benmurgi motions are passed, requiring all EDA's to adopt a new, basic Constitution, and only the Party can approve amendments to it, then the Party will always have a copy of the current Constitution on file. I suppose that motion could fail, though, leaving the current situation. Since it's a best practice to submit a current copy of a local constitution to the National Office, I would generally have no problem with that. But...why a Certified copy? What does that mean anyway? That the CEO has to physically sign it, or will a simple email with the Constitution suffice? My interpretation is this: the CEO will have to sign it in front of a notary. That's the only way to “certify” a document. Why else would the motion use the word “certified” when it could have used the word “provided”? The CEO has no special powers of certification just by virtue of being a CEO. Do you disagree with my opinion? That's fine, and I guess we'll find out who is right about the term “certified” when it becomes an issue between the Central Party and your EDA. And as we'll see, those consequences could be significant. G10-c20 requires that all Officers of the EDA be members in good standing. This Benmurgi motion is not in keeping with the approach to members set out in the GPC Constitution, however it doesn't actually contradict it, as it deals with a bit of a different issue. But I'm not sure why valid members of the Party should be denied being Officers of the EDA. Don't see it that way? Go back to the GPC Constitution and try to find where it says that lapsed members aren't members. You won't find it. This Benmurgi motion is problematic for a few other reasons. First, it's not unusual for someone on a local Executive to forget to pay their Party dues right on time, even with all of the notices we receive from the Party to do so. Right now here in Sudbury we have a member of our Executive, who is also an Officer of our Association as per Elections Canada, who is a lapsed member (despite all of those reminders...and if you're reading this and you know who you are, please, pay up!). Many EDA's, though, have only the CEO and the FA identified as Officers. That may seem fine, and that may be the advice you've received from your organizer (it was the advice we received, given because every change of Officers needs to be documented with Elections Canada; the more officers, the more potential changes). But what would happen to an EDA where both the CEO and the FA forget to pay their dues, if this motion is passed? This Benmurgi motion has no flexibility at all. It simply states that all Officers must be members in good standing. If an Officer is no longer a member in good standing, they are no longer an officer, file the paperwork with Elections Canada. If ALL Officers cease to be members in good standing and are no longer Officers of the EDA, what happens to the EDA? It goes bye-bye, that's what. There will no longer be continuity; there will be no one left to call an election of Officers or appoint them for that matter, because the EDA will have ceased to be. Given that this motion is a) not in keeping with our Constitution, and b) seeks to create more situations where EDA's can fall apart through oversight, this Benmurgi motion deserves to bite the dust. Federal Council. At least this Benmurgi motion identified the appropriate requesting unit. Anyway, this one seems harmless, right? But what if Fed Council has a real hate on for a particular EDA (and don't think it hasn't happened). Council requests a copy of each and every transaction, dating back to the establishment of the EDA (despite the fact that CEO and FA ran away to Mexico together, taking the only copies of the receipts with them). My point is that EDA's will have to comply with even the unreasonable requests from Fed Council. And not doing so could lead to serious consequences. Due to the vagueness of this motion, local autonomy for EDA's will suffer. G10-c22 sets out the first set of consequences for not complying with the earlier Benmurgi motions: Your EDA may be denied it's portion of the funding it is supposed to receive through the Revenue Sharing Agreement (RSA). Seems like a fair consequence, eh? Maybe it would be if the requirements for compliance were clear. But they're not clear. They're vague and ambiguous, and open to interpretation. And therefore open to abuse. If we pass these Benmurgi motions, EDA's will be surrendering an incredible amount of autonomy to the Central Party. The Benmurgi motions will completely alter the existing power structure of the Party, and completely in favour of the Central Party with little benefit and significant headaches to local EDA's. Remember that EDA's are comprised largely of volunteers who are just trying to do the best job they can (and the other part of our composition consists of volunteers who aren't trying to do the best job that they can, but I believe those people are a minority throughout Canada). Point is we're volunteers, and we get pretty demotivated when we're crapped on. The Benmurgi motions are a bit of a demotivator, to say the least. Which leads us to G10-c23, the last Benmurgi motion, which indicates that EDA's which are not in compliance with a number of things, mainly those taken from previous Benmurgi motions, can be de-registered. There are a few extra things thrown in here for good measure which I'd like to explore. First off, I understand that this motion will not mean that all non-compliant EDA's will be automatically de-registered by the Party. That would be foolish to think. However, given the number, and vagueness, of the items to which an EDA must be compliant, the door will be open for the Party to de-register an EDA very easily if this Benmurgi motion is passed. This motion requires that an EDA's Constitution be consistent with the GPC Constitution. I agree that's a worthy cause, and we should always strive for consistency. But who determines what “consistent” really means? In my job, that's a word that I have to ponder a lot, “consistent”. I'm still not absolutely certain that I know the meaning. I like to think that I'll know consistency when I see it, but certainly my take on “consistent” is not at all “consistent” with that of others. In short, there's a lot of disagreement about what it means to be consistent, at least in my workplace. (If you're wondering what I'm going on about here, I work for the Provincial Government, and one of the land use planning policies that exists in legislation is that all decisions made by local governments, such as municipalities, made under the Planning Act shall be consistent with the provincial policy. So, was expanding that settlement area into prime agricultural land consistent with provincial policy? Maybe it was...maybe not. That's what we look at). The point here is that an inconsistent Constitution, whatever that is, could get your EDA deregistered. And what about if your EDA doesn't share the purposes of the Party? What does that mean, anyway? What if your EDA has nominated a candidate to run in the next election, but the Party decides that it's going to enter into a strategic voting pact with one or more of the other parties. First, who would have authorized such an action, and second, if your candidate was told not to run, how would that be in keeping with the purpose of the Party? Who gets to decide? If the above example seems extreme, what about this one: and EDA is told to hold a candidate nomination meeting and follow the rules provided by the Party. But the rules are not in keeping with the Party's Constitution. What's the purpose of the Party here? To nominate candidates, or to do so in compliance with the Party's Constitution? Yet EDA's have been told to do just that in the past. So you could be damned if you do, and damned if you don't. What I'm getting at here is that the wording is vague and open to considerable interpretation. Yet all of the power for de-registration will lie with the Central Party. The scales will be tipped so far in favour of the Central Party, that if an EDA disagrees with even the interpretation of what it means to be compliant, they could still be out of luck. Not holding an AGM once every 15 months is one thing, but what about that “certified” copy of a constitution tucked away in a filing cabinet at National Headquarters? Or what about having a consistent constitution? Here's my analysis: these Benmurgi motions go too far. There may be one or two which I can individually support, assuming that a “riding association” is intended to mean an EDA. But only G10-c14 and c15 seem to fall into that category. The others are too vague. They are ambiguous. And they are open to interpretation. And given that they will create a power structure within the Party which is completely tipped in favour of the Central Party, I can not support what they are trying to do. Look, we keep saying that this is a grassroots party, and then we encounter this sort of attempt at power consolidation. I want to devote my time and effort to going out there and getting our nominated candidate elected, but instead here I am at 3 AM writing about yet another attempt at grabbing power being made by the Central Party (if you know who the sponsors of the Benmurgi motions are, you'll see that most are affiliated with Central Party governance). Rather than club EDA's over the head with these new requirements and create situations where potentially non-compliance can lead very quickly to funding being withheld or an EDA being de-registered, why isn't the Central Party trying to support it's volunteer driven EDA's by establishing and codifying clear best practices, and providing EDA's with the tools necessary to carry them out? Some may feel that the Benmurgi motions seek to do just that, but if all that these motions wanted to do was codify best practices, why the imprecise language, which drastically tips the scales against local EDA autonomy? Sorry, but it looks to me like these motions are seeking to create every opportunity for the Central Party to punish what they view as wayward EDA's, and punish quickly and decisively. And that's no way to run this Party. Thanks for that Steve, as a relatively new member and not being on the executive of my EDA I had not thought of these motions in that light. It seems to me that much of the internal bickering on various issues are caused by previously adopted rules/ motions with imprecise language and had thought that the prescreening of these motions was an effort to improve that situation. Seems that did not work out so well! EDAs should have to meet a standard for democratic control. This protects the interests of the members. The members of the party passing motions at the BGM to create such a standard strengthens the grassroots values of our party by ensuring that all members in a riding are able to participate locally. These motions don't "club EDA's over the head". Perhaps your EDA has always been perfectly democratic but in my riding a series of EDA dictators have all but killed GPC involvement and we are only starting to rebuild now. This is not power consolidation rather these motions take consolidated power away from executives and force them to be accountable to their members. As a party we are one member, one vote, not a collection of EDAs working under FPTP. Honestly, Steve, I commend your dedication to the Green Party for putting up with everything that goes on in it. Even a cursory peak into the inner workings of the Green Party reveals that it does not live up to its own standards.